Saint Sophia Cathedral (Greek: Hagia Sophia, meaning Holy Wisdom) in the Byzantine-Latino Quarter of Los Angeles, California, is a cathedral in the Metropolis of San Francisco of the Greek Orthodox Archdiocese of America. Having become head of "Fox West Coast" in the Hollywood cinema industry, Charles Skouras built St. Sophia in 1952 to fulfill a vow to God to build a majestic cathedral if he were successful in the show industry. St. Sophia Cathedral is located in the Pico district in the western part of the city of Los Angeles. Construction of the cathedral began in 1948 and was completed in 1952. The inspiration behind the design of the cathedral was that of the original Hagia Sophia in Constantinople. The original design for Los Angeles, however, was scaled back significantly, yet still produced an impressive church. While the exterior is simple, the interior is full of light, mirroring Orthodox thought that the interior of the human being should be light. The cathedral has a cruciform design, built with consideration of the seismic activity in earthquake-prone southern California. A "Hollywood" flair is present in the furnishings of the interior. 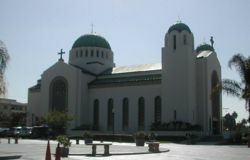 When the cathedral was completed in 1952, the area around it was ethnically Greek. Since then, the population of the neighborhood has changed. To accommodate this change, Spanish has been introduced along with Greek and English in the services. The 36th Biennial Clergy-Laity Congress of the Greek Orthodox Archdiocese, held in 2002, convened at the cathedral under the theme of Offering Orthodox Faith to Contemporary America. It included a liturgy in the three languages, with children from the Orthodox orphanage in Tijuana, Mexico, providing musical responses. This page was last edited on October 6, 2015, at 00:36. This page has been accessed 16,117 times.